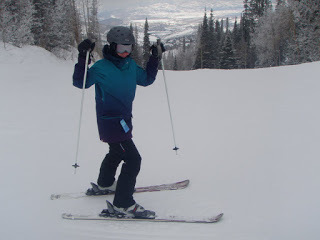 Me at the top of Bald Mountain at Deer Valley! It has been an exhausting and absolutely wonderful past few days, and now that I’m home and have had time to reflect, I feel so blessed to have been a part of such an amazing fundraising experience! 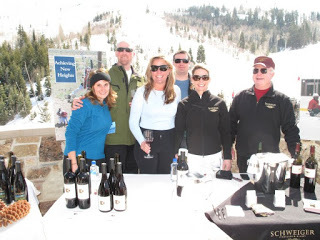 I just returned from Park City, Utah, where I poured Carina Cellars wines at Red, White and Snow…one of the biggest fundraisers for the National Ability Center (NAC). Founded in 1985, the NAC enables individuals with physical and cognitive disabilities to develop lifetime skills by providing sports and recreational experiences in a nurturing environment. In their mission statement they boast of promoting “the concept of ability through integration, public awareness, and education,” and over the past few days I have come to experience what great work they do first-hand. Red, White and Snow is a 3-day long fundraiser that brings winemakers from California out to Park City to pour wine at numerous events in order to raise money to fund the various programs they offer. 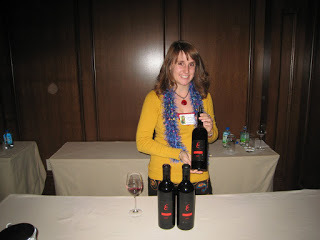 In 3 days I poured at 2 tastings and 2 dinners, and had the privilege to meet a variety of people from all over the country (chefs, vintners, athletes, para-olympians) who came together to make this event possible. And I even learned to ski! And yet the biggest lesson I learned was this: to feel. I know I’m not alone when I admit that there are times when my mind is going a mile a minute, and is so overloaded that by the end of the day I just crash; mentally exhausted. In learning to ski, I’ll admit that the past couple times I’ve gone, it’s been a rather terrifying experience because I wasn’t able to control myself; the whole time I kept thinking about how I could fall that might hurt the least amount or how to slow myself down. This time though, my teacher Sally Tauber (president of the NAC and a skiing legend), gave me the simplest piece of advice: allow your body to feel which way the skis want to go, and which way your momentum takes you. It took a few runs to change my mentality from panicked over-analyzation to be solely in the moment, but once I cleared my mind and allowed my entire body and mind to simply feel, I no longer struggled. I did fall several more times, but it was ok because I allowed my mind to realize that it’s ok to fall; that’s part of the learning. I know I tend to over-extend myself and try to do too much: to take on too many work projects, to try to accomplish too many personal goals in an unrealistic time period. At times I become so over-loaded that I know I’m not completely present in what I’m doing that very moment. So in life, as in skiing, I’ve realized that I need to allow myself to stop thinking, to clear my mind, and feel what my next move should be. And after this weekend I know it felt right to be supporting such an amazing organization, and I look forward to allowing my momentum to take me where it will. 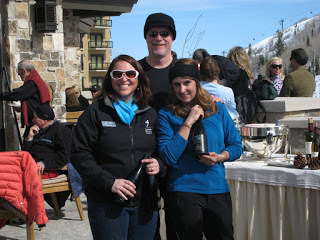 “Wine on the Mountain” tasting event on the terrace at the St. Regis at Deer Valley. Posing with my new wine friends: Rory Lynch of Terra Valentine, Erin Eagan of the NAC, Brandon Webster of Young’s Market, and the Schweiger team! 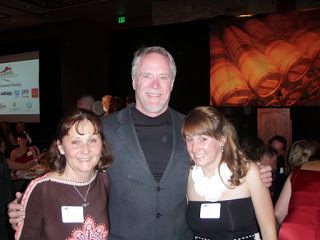 My amazing parents: Lynda and David, who came out and supported me at all of the events! The beginnings of Utah craziness! Well written Carolyn. I agree wholeheartedly that this was a weekend to 'feel'. After running around like a chicken with my head cut off the last few weeks/months this was a weekend of great gratitude for me. Gratitude for vintners like you, who make the trek up to Park City to support the NAC, and for every donor (including Carina) who open their hearts and wallets–and change lives. Thank you for your willingness to get involved. You efforts have, and will continue to make a difference in the lives of many NAC participants and families.